The return of a New York special! A chance to hear saxophonist Gilad Atzmon with guitarist Saul Rubin, frequently in the band of Sonny Rollins and visiting from New York. They are joined by Yaron Stavi on bass and Enzo Zirillli. 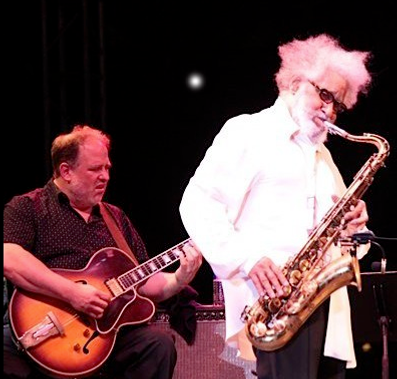 A mainstay on the New York jazz scene, Saul Rubin graduated from the Hartt School of Music, where he majored in composition and studied jazz with the legendary saxophonist Jackie McLean and saxophonist/arranger Paul Jeffrey, before moving back home to New York. Since then his soulful and virtuosic playing has been heard alongside some of the world’s greatest jazz musicians, including Sonny Rollins (touring Europe and the US), Roy Hargrove (he arranged for the Roy Hargrove Big Band album Emergence (Verve, 2009), and has toured extensively with them throughout Europe, Canada, Japan and the US), Renee Fleming, John Hicks, Victor Lewis, Bob Cranshaw, Sammy Figueroa, Johnny O’Neal, Hank Jones, Frank Wess, Cameron Brown, Candido, Winard Harper, Larry Willis, Sue Terry, Essiet Essiet, Willie Jones III, Eric Revis, James Hurt, Gerald Cannon, Sherman Irby, Lew Soloff, Jonathan Batiste, Roberta Gambarini, and many more. In 2009, Saul opened Zeb’s in a New York loft in Chelsea, a performance and production space where countless artists have since performed and recorded. In 2010 he began curating a successful weekly jazz vocal series (hosting and accompanying such luminaries as Gregory Porter, Roseanna Vitro, Nancy Harms, Bob Dorough, Johnny O’Neal, Tessa Souter and Brianna Thomas). For three years he has produced the NYC Jazz Guitar Festival, showcasing some of the world’s best jazz guitarists, including Bucky Pizzarelli, Gene Bertoncini, Peter Bernstein and Paul Bollenback. He has performed at the Blue Note (Tokyo and New York), the Jazz Standard, Dizzy’s Club Coca Cola, Fat Cat, Smalls, Mezzrow, the Hollywood Bowl, and concert halls all over the world, including London, Vienna, Geneva, Barcelona and Prague. As well as recording for other artists, he has released two albums as a leader, The Saul Rubin Quartet (2004), featuring John Hicks, Gerald Cannon and Montez Coleman, and Saul Rubin: The Zebtet (Red Records, 2015), featuring Stacy Dillard, JohnnyO’Neal and Fabio Morgera.